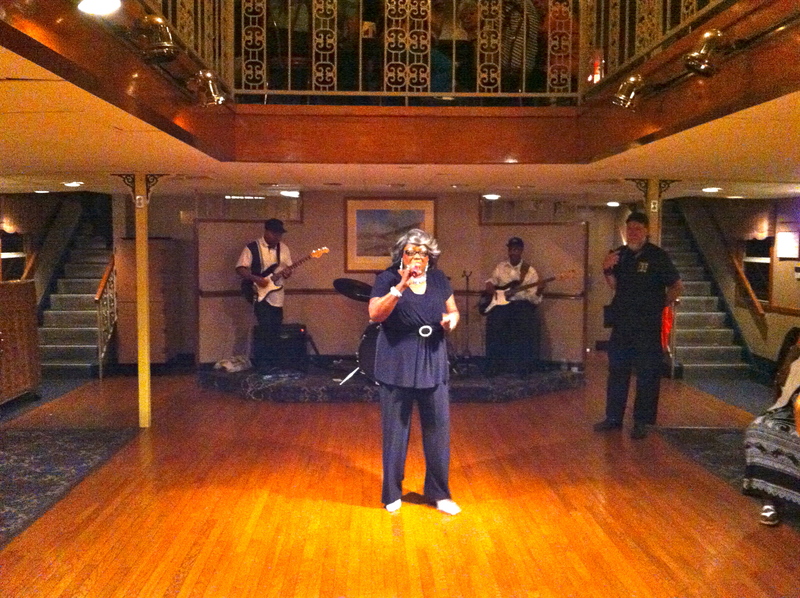 Once a month when the weather is warm, a steamboat departs from the base of the Grand Staircase by the Arch for 2 1/2 hours of live blues music. I went on the September boat ride with my friend, Pamela. The weather was warm- in the mid 70’s which made the night even better. 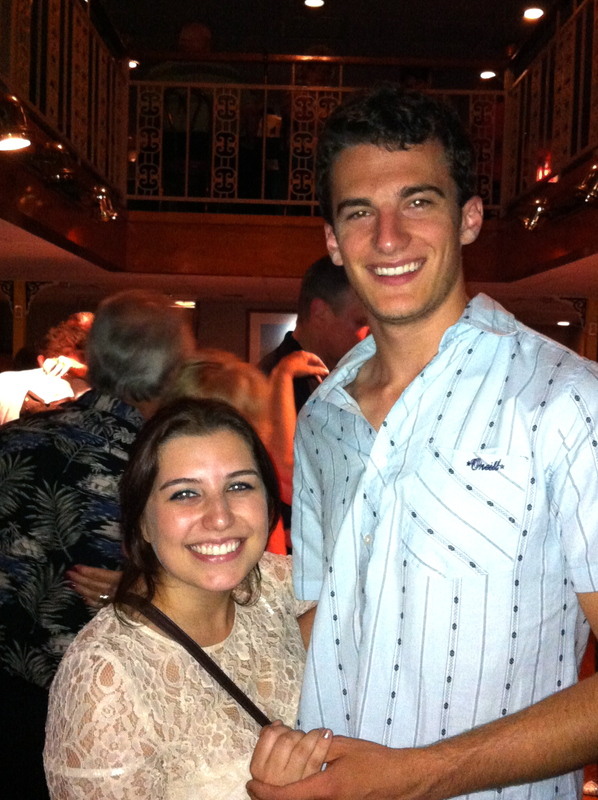 Dance partners for the night: Pamela and I on the boat. Upon boarding the boat, we quickly realized that we were the youngest people on the boat by at least 20 years, as the steamboat was full of middle aged couples in what I could only describe as 1930’s high Southern fashion. For all we knew, this could have been a Tom Sawyer-era riverboat party. The boat took off promptly at 9 and the band started to play. St. Louis is known for its blues scene, so the band was a really good local band complete with keys, sax, guitar, drums, and a powerful female vocalist. 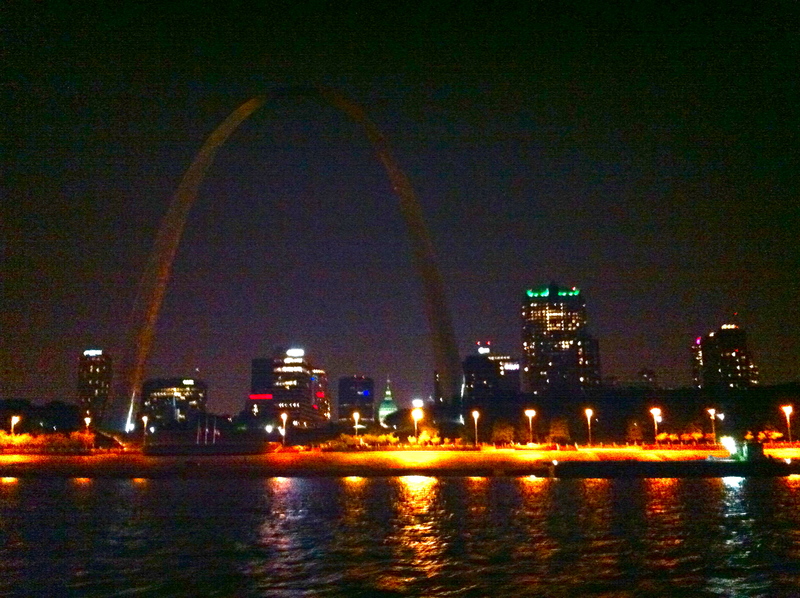 While the band started out strong, the crowd started out mellow, as lots of people were on the top deck checking out the postcard-perfect view of the St. Louis skyline. However, after about an hour, the Blue Cruise became the Booze Cruise, as most everyone on the boat got drunk from the cash bar. That was the turning point, as more couples came out to dance. The best song of the night was a heartfelt rendition of “Stand By Me”, which definitely proved why the Blues Cruise is considered to be the Best Spot for Slow Dancing according to the Riverfront Times. Late on, things got a lot more funky, as they played the Electric Slide, and one of the older couples taught us how to “get down on the dance floor”. Finally, the boat pulled back into the dock. The boat ride was so unexpectedly fun. Since you can’t leave the boat, everyone really put their all into having a fun time on the boat. Even if blues music isn’t your thing, go on the Blues Cruise for a fun crowd, a throwback atmosphere, and amazing views of the city.